Glenallachie is one of those distilleries that you hardly hear from. That has everything to do with the fact that it is a silent partner in a whole lot of blends like Clan Campbell, House of Lords, White Heather, 100 Pipers, Passport, Queen Ann, Highland Clan and Chivas Regal. But it can hardly be found as an official bottling. There are plenty of independent bottlings though. 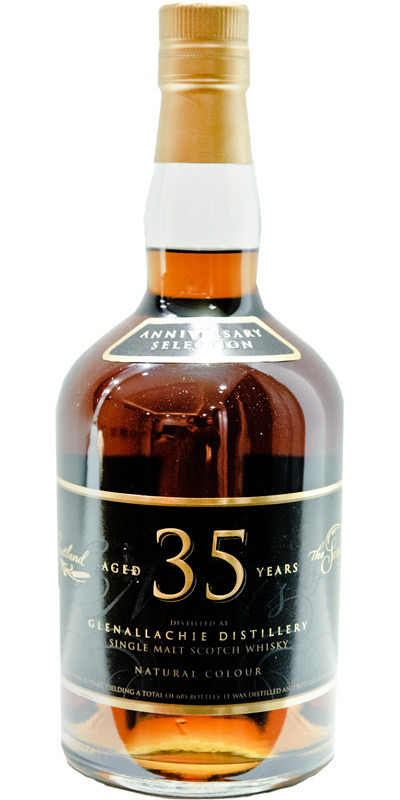 This 35 Year Old appeared in 2010, bottled by Specialty Drinks and matured on a first fill sherry cask. I got to taste it during a Father’s Day menu at a local whisky restaurant, where it was served next to my Angus Rib Eye Steak. The generous chef gave me a nice sample to take home to taste it again. I did that the very next day. It is not a sherry monster, but comes quite close. It smells wonderfully old with with loads of fruit. Think overripe banana, grilled pineapple, figs and prunes. But also nice hints of polished leather, tobacco leafs, old red wine and something of rum. Soy sauce. Oh, boy, what a great mouth feel. Sweet and sou rand spicy upon arrival – even a bit umama – on coffee liqueur, roasted cocoa beans and rancio. Then it turns a bit sweeter on prunes and cherries, but it never loses that sharp edge of the toasted oak – which I find to be very complimentary. Cinnamon and black pepper. On the edge of being astringent, without it becoming naughty. Great balance. All this continues into the very long finish in which I again discover coffee liqueur. 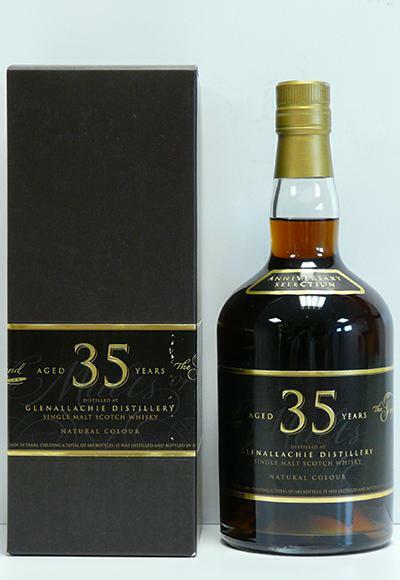 Is this the best Glenallachie ever? Could very well be. And while I am very grateful to my wife and kids for this surprise dinner (it had been way to long since my last visit to restaurant ‘t Konijntje), I would also like to thank Jos for spoiling me so. And not just because his cooking is out of this world, but also because he knows exactly which whisky serve with the food. And he has some real gems. Thanks, Jos and Tanya! We will be back soon. Only my fourth Glenallachie. Although its one of the larger whisky distilleries in Scotland producing around four million litres of spirit a year , virtually all of it goes into the Chivas blends. Speciality bottled this in 2010 for their 10th Anniversary. T: Right up my street, tincture sweet, heather malt. F: Proceeds with Pledge, peas and polish with leather, heather and hay. Rolls on with the dry heather and a little bitter-herbal. This is one of those old 1960`s sherried whisky`s that you need to spend time with to find the distillery character and get the best from it. The nose is lovely but the palate is a little bitter and the oak is certainly present, luckily it does not detract from the profile too much. Worth trying. 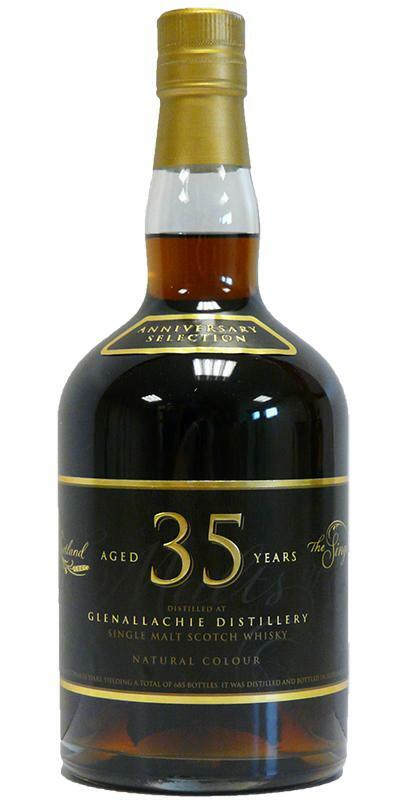 I feel this is an old school sherried Speysider that many will love. It reminded me of some of the old 60`s- 70`s Gordon & Macphail Balblair bottlings. Sherry, almonds, raisins, coffe - excellent nose on this. Bitter sherry at first then coffee & raisins again, a little rough. The style reminds me of Yamazaki Sherry Cask 2013 minus the immense fruitiness. Feels very mature, classy, rich. Simply great. A whiff of peat smoke, ashes from a bonfire, a bit of oak. 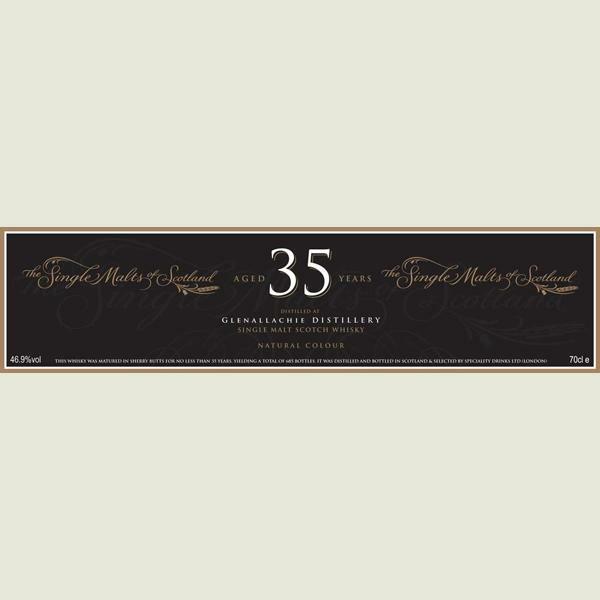 These notes are nicely balanced by the sweetness of sugar (as in good rum) and dark fruits. Complex and very dignified. Full-bodied, oily, very rich. The taste is more fruity than the nose with fruity sweetness lined up with the notes of cocoa, coffee, a handful of nuts. Quite long with peat smoke, leather and dark fruit notes. This is a remarkable dram to say the least. A very a-typical sherry whisky, but I would love to get my hands on a bottle of this. Some impressive aromas here with leather, rubber, wet wood, wood smoke, charred pine wood and ripe bananas. This is a type of sherry matured whisky that I haven't come across before. There's is barely any (red) fruitiness. Give it some time and other aromas like tobacco, hay and wood shavings appear. The term complex sums this up perfectly. There is a fair amount of peat on the palate. It's almost medicinal. The leather notes translate perfectly. Some tobacco and gunpowder surface after a while. It also has a syrupy quality. Oh, and before I forget: it is very woody, almost like licking wood. Interestingly enough, I do not find it to woody, but I bet that plenty of people would disagree. Campfire, ashes, leather and now finally a little bit of red fruit. It lingers for a long, long time. An excellent whisky, balanced, powerful and complex. I love. Rich, combining a salty and marine character with hottest notes of sherry, such as balsamic vinegar, old leather, almond paste, nuts, coffee liqueur. A light oak brings a certain maturity to the whole. The second tasting adds to that the freshness of eucalyptus. Powerful, relatively oily texture, it is salty and marked by sherry which gives it the acidity of balsamic vinegar, the scent of mandarin and the greediness of dried fruits, although the latter are set back. The finish is marked by a spicy explosion (pepper, clove). Long, salty and spicy, with cloves that combine with sherry. Some old and quite classy material, for sure, that would have had a hard time spending some extra time in the cask. Those who like their old Speysiders not overwhelmed by the Sherry and sultanas should be delighted. Nope, it didn't. The attack is on the same line than the nose, soft and fruity like an old Brandy. The mouth gets bolder then, developing on coffee liqueur (Kahlua?) and roasted cocoa beans. More wood and spices now (cinnamon ganache? ), along with a slight astringency and a hint of burnt wood ala Glendronach. Nothing disturbing, but this nice Sherry cask was bottled just in time! The alcohol is perfectly balanced.